Some late-model Toyota Avalons, Camrys and Highlanders with certain advanced safety options see the MSRP price of a replacement front grille emblem shoot up by more than $900 — sort of — according to Mitchell and Toyota dealer information. The reason: The low-tech logo has become high-tech. Radar for safety systems like automatic braking and adaptive cruise control “sees” through it, something it can’t do with the standard emblem. He noted, however, that the more expensive component was only found on a tiny portion of the Mitchell 2010-15 Toyota Camry data set. Opt for the advanced technology options package, and Toyota uses a different emblem, bumping the price of a replacement logo to an MSRP of $965.58 for all three models. But this version is only sold as part of an entire assembly — also necessary for the safety package — unlike the standard logo. An assembly-assembly comparison (no logos) also shows an MSRP difference of about $500. The higher-priced logo/assembly seems to have first appeared between the 2013-15 model years for the Avalon, Highlander and Camry. Toyota isn’t the only OEM where a previously “cosmetic” part saw a price jump because of the new technology available — and likely soon to become standard — to drivers. Edmunds noted last year how the design of a 2015 Ford F-150 Lariat taillamp containing a sensor required an expensive replacement of the entire unit for a sledgehammer-induced crack. A new taillamp without the safety option would have been hundreds of dollars cheaper, Edmunds reported. Horn recalled an anecdote where a shop who’d failed to notice the difference threw off the Camry’s adaptive cruise control, which modulates ones cruise control speed to maintain a safe distance from the driver ahead. The system also must be transparent for the Camry’s automatic braking to protect drivers. In the 2015 model year, both features were part of the $750 “Advanced Technology Package,” also includes autobraking, automatic high- and low-beam switching and lane departure alerts. Toyota said Wednesday that some of these are unbundled, requiring different transparant emblems. 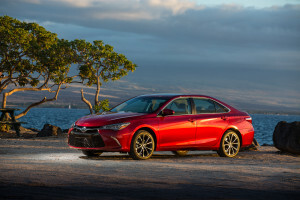 Like most MSRPs, the price for the 2015 Camry component falls in the real world — you can buy the standard logo for about $35-$40 and the fancy advanced-technology one with assembly for around $640-$700, based on a Google glance at Toyota dealer listings. That’s still quite a leap. Of course, there’s also the argument that while such safety systems raise the price of related OEM parts, they also cut down the number of times insurers or out-of-pocket consumers would have to buy those parts or any others. If your adaptive cruise control or auto-braking keeps you from rear-ending the guy in front of you, then you have no need for a $900 replacement emblem/assembly. The entire discussion becomes moot. Indeed, Progressive has predicted that safety systems in the entire U.S. fleet will ultimately lower collision frequency but raise severity — but the drop in frequency more than compensates for that. 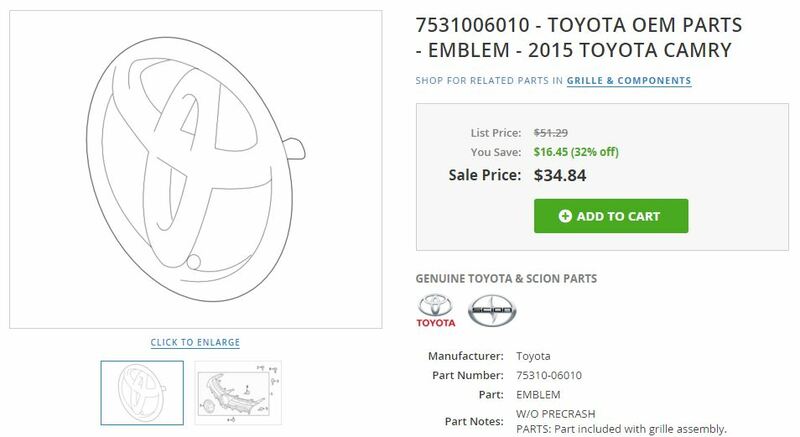 At first glance, the story of the Toyota emblem/assembly seems to be a ringing argument for aftermarket parts. OEMs are out of control with pricing of items protected by intellectual property law, aftermarket manufacturers and insurers argue, so buy a knock-off and show ’em who’s boss. But while we’re certainly not calling the unit a steal at $966 — and we’d hate to see insurers try to make up the difference with labor rate crackdowns — the tale actually also makes a compelling case against generics. Think about it. In this case, arguably the most “cosmetic” part on the entire car has an impact on vehicle safety. 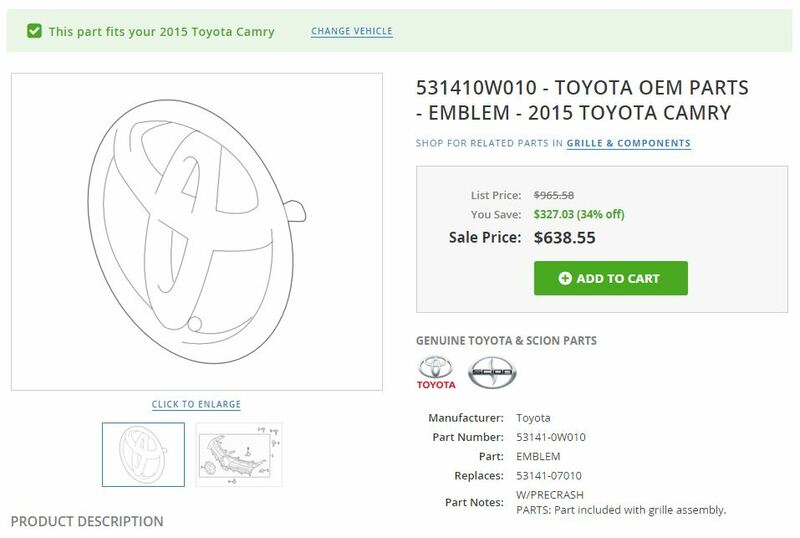 Duplicate the emblem composition incorrectly — even with an identical-looking OEM part, as the shop in Horn’s anecdote did — and the customer suddenly loses access to the convenience and protection of an option they paid extra to obtain. The insurer’s risk management calculations are thrown out of whack, as a feature for which they’ve granted a premium discount no longer protects the policyholder. Logos are subject to trademark protections, which makes it less likely that the emblem itself would be the target of a knock-off than another “cosmetic” part. But in the Camry’s case, the assembly itself also switches from “cosmetic” to necessary if the options package is installed. Copy that incorrectly, and the safety features might not work. A similar case was described by John Ellis of Ellis and Associates during a 2015 SEMA panel. Ellis told the audience about a man who swapped out an Ford F-150 grille — only to have the new version block his adaptive cruise control.